About a year and a half ago, I started an E-Learning Heroes forum thread, “Freelancers: Where Do You Find Most of Your Work?” To be honest, I felt stupid asking it, but as a newly full-time freelancer, I was in a slow period and looking for answers. However, my sheepishness turned to surprise when I saw how strongly it resonated with the Articulate community. After a few weeks of dizzying activity on the original thread, I created a Freelance Heroes thread to capture what I believe are some of the most helpful discussions about e-learning freelancing anywhere. Now this thread is closing in on its thousandth post, inspiring me to recap the most popular discussions, suggestions, and assets shared there. The Articulate community has given me so much through this thread—I figured it’s high time I gave back. Over the next few weeks, I’ll highlight the key advice that’s emerged from these threads. In this article, I’ll talk about how to prepare yourself to go freelance. 1. Find your focus. It takes a lot of skills to create high-quality e-learning. What do you do a little bit better than others? What part of the process do you enjoy the most? Maybe it’s your knack for writing, performance consulting, graphic design, or wizardry with Articulate products. If you know what unique value you offer and what aspects of e-learning you enjoy most, you can focus on the right kinds of projects and clients. 2. Save some money first. Nobody likes to work under pressure—especially money pressure. With a little cash in reserve, you’ll have some breathing room to take the projects you want that will build your profile. If you have to take any old gig that comes your way just to make ends meet, you may end up with a disparate portfolio that’s not focused on your desired area of expertise for prospective clients. 3. Set up an online base of operations. This is where you’ll host your opinions and samples of your work. For some, this might be a blog or website; for others, it might be a social media channel, such as LinkedIn. Wherever it is, keep this base of operations current. Make it easy for people to find and contact you. 4. Create an online portfolio. Don’t have an instructional design degree? No worries. Build a good-looking portfolio and you’ll get gigs. You’ll need some content, of course. Develop a mini-lesson on a professional subject you know a lot about and share it on various channels. Create a pro-bono e-learning course for an organization you care about. If you need help finding an organization, you might want to volunteer for LINGOS, as Tom Kuhlmann suggests in his blog. 5. Track your time. Even if you are working on your very first e-learning project, start tracking how many hours you spend on it. Break it down into categories such as communication with client, storyboarding, course development, and so on. You’ll likely be surprised. It doesn’t matter if you use pen and paper, a spreadsheet, or a time-tracking tool such as Harvest—just make sure you do it. Your success as a freelancer hinges upon your ability to estimate the hours a project will take, and price it accordingly. freelanceswitch.com is one of the most popular sites devoted to freelancers. It contains a blog, resources, forum, and job board. A favorite is “A Comprehensive Guide to Starting Your Freelance Career“. Freelancefolder.com is another well-respected site and, like Freelanceswitch.com, contains a blog, resources, forum, and job board. Fast Company magazine’s article “How to Be a Happy and Successful Creative Freelancer (or Work with One)” contains information on the creative process, getting paid, building brand, and setting up your office. Bruce Graham’s presentation, “Being an E-Learning Freelancer,” contains many helpful tips. Good luck, and feel free to post comments here or add your own ideas to the Freelance Heroes thread on E-Learning Heroes. Like what you read here? Get more e-learning tips by following Articulate on Twitter and joining the E-Learning Heroes community. Best ever resource for Instructional Design freelancers/eLearning freelancers that I have ever come across. Thank you for your efforts on this, and other, freelance thread. I’ve been freelancing for 5+ years, and will follow along with you. If my Lessons Learned can help any new freelancers, I will humbly share. #2 – Have six months to one year’s salary in savings. #4 – Yes, very true. Potential clients are your audience, no matter what other IDs may say. FreelanceSwitch.com has made some changes. Visit their home page to see the new URLs. Looking forward to more conversations, as I know I’m always learning. Thanks Daniel for your tips. I agree with your point suggesting to save money before you go for full time freelancing, as this could not only helps you in being financially stable but also allows you to focus on you job. +1 Vandana – GREAT point, as focus, and some semblance of normality is vital in the first year. Thanks for all the great links. I have been freelancing for 8 years now – all by word-of-mouth. As a New Year’s resolution I am working to increase my client base and my online presence. This has some great info and sets to check out! 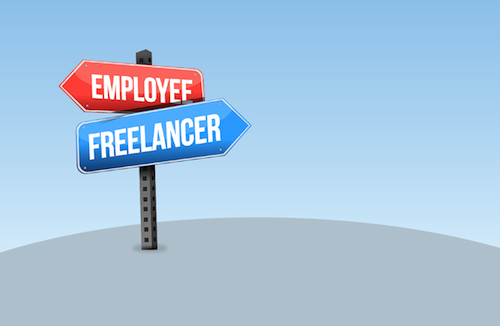 Today’s the trend of freelancing is increasing day by day. And many of us thinking to start their carrier as a freelancer and get frustrated after some time. Because in this kind of job a lot of patience is required only then one can become successful in this field. And you have also shared great tips for carrier start up as a freelancer. I am also working as freelancer and you can check my work here http://www.safefreelancer.com/. And I am very much happy with my profession.